Super light and twice-baked: that's what earns them the name Biscottini. These Novara delicacies are skilfully crafted from a simple recipe based on eggs, sugar and flour and are completely free from lactose or added fats. An authentic speciality, so light and delicate that it can be enjoyed anytime without guilt! Ingredients Wheat flour, sugar, fresh eggs (24%). Raising agent: ammonium bicarbonate. Natural vanilla pod flavouring. Allergens: contains gluten, eggs. For more information on product labels, please contact our Customer Service department. The information on the labels of the products may vary for reasons beyond our control, therefore, there may be discrepancies between the information on the site and that on the products delivered. Please always check the information on the product before consumption or use. 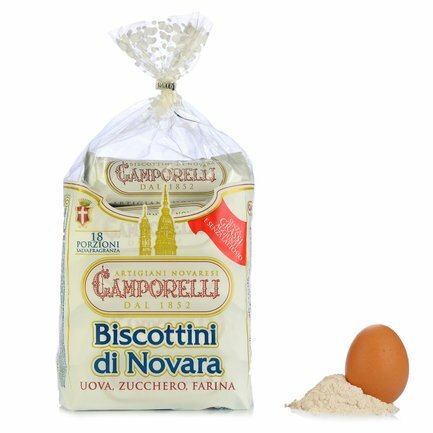 Biscottificio Camporelli has been indulging the palates of the most dedicated gourmands since 1852, achieving fame due to its legendary attention to the quality of the ingredients employed and its rejection of added fats and artificial ingredients in its production process. Thanks to its consolidated and time-honoured experience, the company remains a beacon of Novara tradition to this day, as confirmed by its receipt of the Artisanal Excellence award, granted by the Piedmont regional administration.